Other Editions . . . Week 2 Headline . . . Week 3 Headline . . . Week 4 Headline . . . Week 5 Headline . . . Week 6 Headline . . . Week 7 Headline . . . Week 8 Headline . . . Welcome to the first edition of “Headline”. Each week you can look forward to all new content as we head towards the reunion on October 8th 2011. 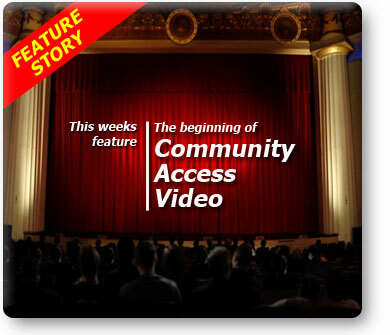 Week by week, new stories, pictures and videos will appear documenting our part of Access Video history. In this first edition, our “Feature” article looks at how two Community Access Video Centres came to be setup in Melbourne’s West. Reunion International Pictures is put under the spotlight in “Profile”, finally revealing to the world who they are. “Backstage” goes behind the scenes at the world premiere of “Scarless - The Movie” on Melbourne Cup Eve, Monday November 4th 1991. Our “Video” of the week uncovers an interview by David Grech with Turtle Video’s first Centre Directors, recorded in 1977. We also go right back to where it all began in the “Galllery” . . . with lots of faces you might remember. And finally browse through the “Paperfile” and read the proposal that may have been the blueprint for Community Access Video in Australia. Enjoy the site and remember it’s an all new edition each week as we count down to the reunion! Members of Aboriginal, Torres Strait Islander and Maori communities are advised that this website may contain names and images of deceased people. All users of the website should also be aware that certain words, terms or descriptions may be culturally sensitive and may be considered inappropriate today, but may have reflected the author's/creator's attitude or that of the period in which they were written. It is never our intention to knowingly infringe anyone else's copyright, if we have inadvertantly done so we apologise and will happily acknowledge the source of any original work on request of the copyright holder or otherwise agree acceptable terms and conditions as to continued use or immediatly remove the item/s upon notification by the copyright holder.